When is a habanero pepper still a habanero pepper? When it’s a cayenne pepper. We aren’t experts on the spiciest of spicy foods, but we’re still kind of confused at about this sauce that reader Chris found in Whole Foods. “It’s a ‘Habanero Pepper Sauce’ that contains no habanero peppers,” he writes. 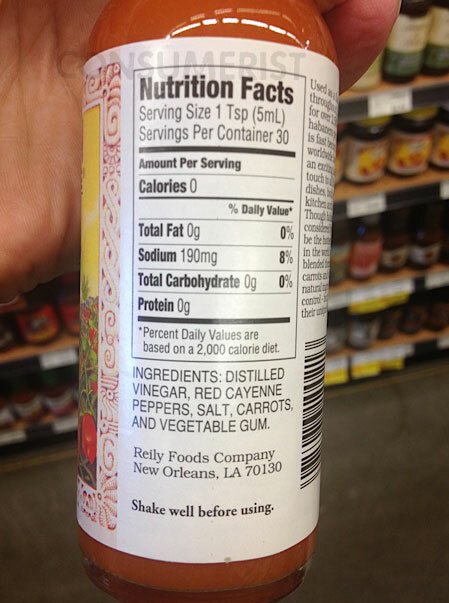 “It always pays to read the ingredients.” How does this even make sense? We decided to ask the company, and just ended up even more confused than we were in the first place. When we sent along the photos and an explanation of Chris’s question, a Reilly Foods representative wrote back. To explain; we recently updated our label and reworded our ingredient statement; we did not change our recipe for TryMe Yucatan Sunshine Habanero Pepper Sauce. There was not a reason for habanero peppers to not be stated on our label as this sauce does contain cayenne and habanero peppers. Cayenne peppers were used inclusive to include habanero peppers. We did not mean to be confusing by only stating cayenne peppers that could allude that habanero peppers are not in the sauce as they are. Your message has been forwarded to our marketing department so that they are aware of this inquiry.